NEW YORK, August 6, 2013 – The Auschwitz Institute for Peace and Reconciliation’s team supporting the Latin American Network is expanding by taking on board two new colleagues from Argentina: Andrea Gualde and Eugenia Carbone. 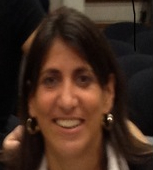 Mrs. Gualde, a professor at Universidad Di Tella, served as Director General of Legal Affairs within the Ministry of Human Rights in Argentina. Mrs. Gualde will come on the team as the AIPR Senior Adviser for Latin America, advising the AIPR leadership on its programs offered in support of the Latin American Network. Ms. Carbone will be the AIPR Director for Latin America and will further develop relations between AIPR and the Network Member States, as well as oversee AIPR’s support for all national initiatives running under the umbrella of the Network. Mrs. Gualde and Ms. Carbone join the AIPR team and will be working directly with Mr. Christopher Kousouros, the AIPR Network Coordinator. The Latin American Network was created in March 2012 in Buenos Aires, with the participation of various governmental institutions from 18 states in Latin America. The goals of the Network were established as the development and implementation of a genocide prevention curriculum into each country’s mandatory training programs, and a regional collaboration effort in the development of national programs on genocide prevention within member states.